Reformulated AMSOIL OE Synthetic Motor Oil achieved 100 percent protection against low-speed pre-ignition (LSPI). AMSOIL has launched a new formulation of its OE Synthetic Motor Oil line to meet the emerging demands of advanced automotive technology. It is specifically designed to deliver maximum wear protection, fuel economy and emissions control for the longer drain intervals recommended by original equipment (OE) manufacturers. Low-speed pre-ignition (LSPI) is a common issue found in today’s advanced engines and is much more destructive than typical pre-ignition. OE Synthetic Motor Oil achieved 100 percent protection against low-speed pre-ignition (LSPI) ¹, and it provides 47 percent more wear protection than required by the GM dexos 1® Gen 2 specification.² AMSOIL OE Synthetic Motor Oil has a 100 percent synthetic, pure chemical structure engineered to remove harmful contaminants and provide long-lasting engine protection and performance. It features an advanced detergent and dispersant additive package designed to protect against sludge and deposits to deliver maximum engine cleanliness. AMSOIL OE Synthetic Motor Oil is licensed by the American Petroleum Institute (API) to meet and exceed the requirements commonly found in owner’s manuals. It excels in fuel-economy testing, earning the additional ‘Resource Conserving” designation from the API. AMSOIL OE Synthetic Motor Oil is also friendly toward modern emissions-control systems to promote proper operation of catalytic converters for optimum service life and low exhaust emissions. 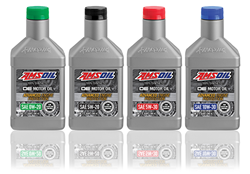 AMSOIL OE Synthetic Motor Oil is available in the following viscosities: 0W-20, 5W-20, 5W-30 and 10W-30. ¹Based on zero LSPI events in five consecutive test of AMSOIL OE 5W-30 Motor Oil in the LSPI engine test required by the GM dexos1 Gen 2 specification. ²Based on independent testing of OE 0W-20 in the Peugeot TU3M Wear Test as required by the GM dexos1 Gen 2 specification.